Platygastridae are mostly koinobiont parasitoids of gall midge (Cecidomyiidae) eggs developing only after the host has reached pupal or prepupal stage. Some are idiobiont parasiotoids of beetle (Coleoptera) or bug (Homoptera) eggs, or Coccoidea or Aleyrodidae larva. The classification presented here follows Masner (1993) with minor updates e.g. Taekal et al. (2014) transferred Psix and Paratelenomus from Telenominae to Scelioninae. A comprehensive phylogenetic assessment based on both morphological and molecular data to formulate a revised classification of Platygastroidea is still required. Murphy et al. (2007) conducted a molecular phylogenetic analysis of the entire Platygastroidea in which the Platygastridae was supported as a monophyletic group nested within Scelionidae. As a result the Scelionidae were retrieved as polyphyletic, but the classification was not revised because of low support for many of the deeper nodes in the cladogram, and inadequate taxon sampling (less than a quarter of the valid genera in the superfamily were included in their analyses). Based on the results of Murphy et al. (2007), Sharkey (2007) formally synonymised Scelionidae with Platygastridae. Subsequently McKellar & Engel (2012) raised the tribes Sparasionini and Nixonini to family level and recognized four families: Nixoniidae, Sparasionidae, Scelionidae and Platygastridae, but in Ortega-Blanca et al. (2014) they treated placement of these two tribes within the Platygastroidea as incertae sedis recognizing only two families: Scelionidae and Platygastridae. These higher classification changes made by Sharkey (2007) and McKellar & Engel (2012) have largely not been accepted (Talamas & Buffington, 2015; Popovici et al. 2017) and until robust phylogenetic data is published the classification of Masner (1993) is followed. Engel, M.S. & Krombein, K.V. 2012. Hymenoptera. In: McGraw-Hill Encyclopedia of Science and Technology. McGraw-Hill Professional, New York. Johnson, N. F. 1992. Catalog of world Proctotrupoidea excluding Platygastridae. Memoirs of the American Entomological Institute 51: 1-825. Masner, L. 1976. Revisionary notes and keys to world genera of Scelionidae (Hymenoptera: Proctotrupoidea). Memoirs of the Entomological Society of Canada 97: 1-87. Masner L. 1993. Superfamily Platygastroidea (pp. 558-565). In GOULET, H. & HUBER, J. (eds). Hymenoptera of the World: an identification guide to families. Research Branch, Agriculture Canada, Ottawa, Canada, 668 pp. Masner L. & Huggert, L. 1989. World review and keys to genera of the subfamily Inostemmatinae with reassignment of the taxa to the Platygastrinae and Sceliotrachelinae (Hymenoptera: Platygastridae). Memoirs of the Entomological Society of Canada, 147: 1-214. McKellar, R.C. & Engel, M.S. 2012. Hymenoptera in Canadian Cretaceous amber (Insecta). Cretaceous Research 35: 258-279. Ortega-Blanco, J., McKellar, R.C. & Engel, M.S. 2014. 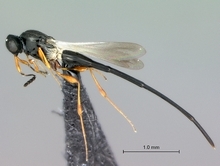 Diverse scelionid wasps in Early Cretaceous amber from Spain (Hymenoptera: Platygastroidea). Bulletin of Geosciences 89: 553–571. Sharkey, M., 2007. Phylogeny and classification of Hymenoptera. Zootaxa 1668: 521–548. Taekul, C., Valerio, A.A., Austin, A.D., Klompen, H. & Johnson, N.F. (2014. Molecular phylogeny of telenomine egg parasitoids (Hymenoptera: Platygastridae s.l. : Telenominae): evolution of host shifts and implications for classification. Systematic Entomology 39: 24–35.